In 1967, Don Young was among a handful of physicists working to turn a dream into the research institution that would become Fermilab. His first job found him in charge of building the linear acceleratorand then 30 years later, the Linac would help save his life. After retiring from the lab, Young was diagnosed with prostate cancer in 2000, and had to decide between surgeryas his doctor recommendedor radiation therapy with protons or neutrons. Bottom Left: Don Young overseeing daily operations of the Linac in 1975. Right: Aidnag A.Z. Diaz of Northern Illinois University is the Medical Director of the NIU Institute for Neutron Therapy at Fermilab. His research interests include malignant brain tumors. "My brother had prostate cancer, and he had surgery to have it removed," says Young. "But he went through a very long recovery period because of the surgery, and I didn't want to go through what my brother went through. I knew the capability of neutrons, and I knew the capability and meticulousness of the people here." Young is one of the many success stories through nearly three decades of the Neutron Therapy Facility at Fermilab. Neutrons destroy cancer cells through nuclear interaction, splitting the atoms in cancerous cells into pairs of different atoms which cannot recombine. Neutrons have a higher biological effectiveness (i.e., tumor-killing power) than both photons and protons, the more common forms of radiation therapy, and they are especially effective against advanced tumorssuch as the one Don Young had. Neutron therapy left him cancer-free. Since 1976, the Neutron Therapy Facilityone of only three such facilities in the United States, and one of only about a dozen worldwidehas treated more than 3100 patients. But the road has been a rough one, with challenges of funding, relatively short-lived collaborations with medical facilities, and consequent interruptions of service. Inoperative for more than a year beginning in 2003, NTF has re-emerged with new support: a collaboration with neighboring Northern Illinois University, becoming the NIU Institute for Neutron Therapy at Fermilab on December 6, 2004; and additional funding facilitated by Speaker of the US House of Representatives Dennis Hastert, who represents the 14th Congressional District of Illinois where Fermilab is sited. The neutrons have returned, and with them have come advances in research, and patients eager for an alternative to other methods of cancer treatment. "Hundreds of patients just in the Chicago area could benefit from this treatment," says Aidnag "A.Z." Diaz of NIU, the new Medical Director of the NTF. A The proton beam travels down the Linac, attaining energies up to 66 MeV. B Two magnets bend and guide part of the proton beam toward the target. C Focusing magnets keep the beam intact and on target. D The deflected proton beam hits a beryllium target, with neutrons among the products. E The neutron beam is aligned with the patient's tumor by the aperture of a cylindrical concrete collimator. F The patient is lowered into the therapy area by elevator, with positioning coordinated by laser, then receives treatment for 1-3 minutes. The patient can communicate to therapists using closed-circuit TV and an intercom system. Clinical trials during the past 30 years have shown that neutron therapy successfully destroys radio-resistant cancers, including salivary gland tumors, adenoidcystic carcinoma, inoperable sarcomas, locally advanced head and neck tumors, and locally advanced prostate cancer. 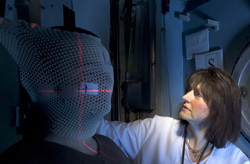 The national Radiation Therapy Oncology Group performed long-term, randomized studies on the effectiveness of neutron therapy, but published many of the results only in conventional print before 1995. That was before the World Wide Web grew to become the actual world-wide standard information resource; thus, many doctors are unaware of these early studies. The NTF plans to get the information into a widely-accessible format. "Many people who first hear about neutron therapy think it's experimental," says Arlene Lennox, Director of Physics at NTF. "Neutron therapy stopped being experimental in 1985." Published results include a study on neutron treatment of prostate cancer, which affects 230,000 new people per year in the United States. The publication of a 1993 nationwide study, which included Fermilab data, concluded: "High energy fast neutron radio-therapy is safe and effective when adequate beam delivery systems and collimation are available, and it is significantly superior to external beam photon radiotherapy in the local-regional treatment of large prostate tumors." The Department of Radiation Oncology at the University of Washington Medical Center in Seattle published a 1993 study on salivary gland tumorswhich are relatively rare but still make up more than 1200 cases per year in the United States. The study concluded: "Fast neutron radio-therapy appears to be the treatment-of-choice for patients with inoperable primary of recurrent malignant salivary gland tumors." Therapist Christine Andorf of Northern Illinois University helps prepare a patient with laser guidance at the Neutron Therapy Facility at Fermilab. Photon therapy (including x-rays) currently treats 95% of cancer radiation patients. Photons displace the outer electrons of the atoms in the tumor cells, temporarily ionizing the atoms, but also allowing time for the electrons to get back in orbit and rebuild the tumor's DNA through chemical reactions, which allows the tumor to start growing again. By contrast, the nuclear interactions of neutron therapy prevent the rebuilding of a tumor's DNA, and halting its growth. The fast neutrons required for therapy are products of proton-beryllium collisions in Fermilab's linear accelerator. Normally, neutron therapy patients receive 12 treatments over a period of three to four weeks, compared with 30 to 40 photon treatments over six to eight weeks. Linac operation must be a dependable constant for patients to receive scheduled treatments without interruption. "Working with physicists who have their own accelerator experiments going on has the potential to create scheduling problems," says Lennox. "But we've had 99.999% uptime at Fermilab. This fantastic uptime occurs because so many people want to cooperate." Arlene Lennox, the Director of Physics at the NTF, started working at Fermilab in 1974 at the meson lab and antiproton source, and on neutron therapy shortly after. Funding has been far less stable. 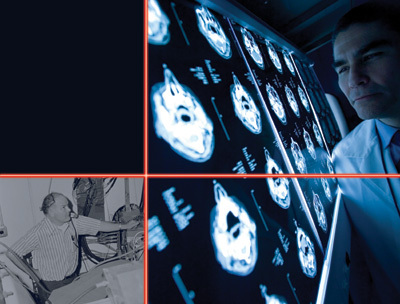 The federal National Cancer Institute (NCI) sponsored investigational neutron cancer therapy in the 1970s and 1980s. In the mid-'80s, an administrative change in the descriptive coding of treatments resulted in neutron therapy sharing this designationand thus, its fundingwith other radiation therapies, such as photon therapy, which is much more widely used. 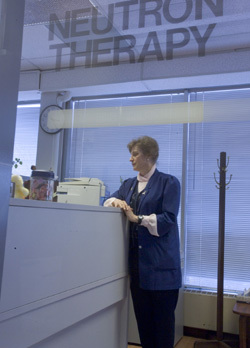 The NTF could not develop a long-term collaboration with a regional medical center, eventually shutting down in 2003. That same year, Speaker Hastert helped secure $2.7 million for the NTF over the next three years. "The NIU Institute for Neutron Therapy at Fermilab not only revives an important facility, it also furthers the entire field of cancer research," Hastert said when the facility reopened last December. The funding delivered by Hastert supplied the seed money needed by any startup business to operate until developing steady sources of revenuea principle well-understood by both NTF and NIU. "NIU worked very hard to understand all the business and financial aspects to develop long-standing therapy," says Lennox. Receiving a dedicated Current Procedural Terminology (CPT) code, which helps standardize levels of medical reimbursement, has been another necessary step for improving and updating business practices at NTF. With its own dedicated code, neutron therapy can now secure more appropriate reimbursement for doctors' services, and consequently can expect more patient referrals. The next step is an evaluation from Medicare's advisory group, the Relative Value Update Committee (RUC). The specialists advising the RUC recommend a reimbursement amount to the Health Care Financing Administration (HCFA), which administers Medicare and determines reimbursement amounts relative to some 9000 medical procedures. "Medicine is a business," says Diaz. "Now there has been an incentive to change our CPT code and be evaluated for a better reimbursement rate." Once doctors in the region are educated about the benefits of neutron therapy and feel greater comfort in making recommendations, their patients could benefit from advancing technology that is currently in varying developmental stages. "Because we are one of only three facilities in this country, we have a mandate to explore the future of neutron therapy. To do that, we need a clinical facility to test the benefits of this therapy on human subjects," says Diaz. Photon therapy: When a photo hits the atoms in a tumor cell, it displaces the atom's outer electrons. If the atom recaptures its lost electrons, the tumor's DNA can rebuild itself and go on to cause more harm. Neutron therapy: A neutron destroys a tumor cell through a nuclear reaction, splitting the atoms in cancerous cells into pair of different atoms which cannot recombine, and halting the tumor's growth. Fermilab physicist Erik Ramberg attended a public lecture by Lennox at Fermilab with his brother when he decided to get involved with neutron therapy. "I wanted to help these guys out. It's clear that they've been running, working and saving people's lives for decades," he says. Ramberg, Mark Austin of NIU, and Bob Florian of Fermilab are conducting computer reconstruction on a vertical CT scanner first built by Lennox and Tom Kroc of Fermilab in order to make it run faster. The vertical CT scanner, which is the only one in the country, is unique because it scans patients standing or sitting, an essential for calculating a neutron dose for a patient. "This treatment drives home the dramatic intersection between particle physics and society," he says. "It's heartening to be able to save people's lives." Ramberg is also spearheading a study that will simulate 3-D orientation of the beam and patient using a program called GEANT4, developed and managed by the international GEANT4 Collaboration of 100 scientists. G.P. Yeh of Fermilab's Computing Division is also working on the project along with Takeharu Ikema of the University of Ryukyus and Yen-Chu Chen of Academia Sinica in Taiwan. "As physicists, we are always trying to do things 100 times better than what we did a few years ago," Yeh says. "And so we invent a lot of new technologies for or from particle physics researchfor example, the World Wide Web, particle detectors, large scale computing, and the x-ray free electron laser, which can be applied to many other fields, including medicine. The result is amazing, isn't it?" Despite the thousands of people who have received neutron therapy, many more people can benefit from neutron treatment. "We need to do more research to understand [neutron therapy's] full potential, and this can only happen through partnerships between major universities like NIU and major laboratories like Fermilab," said Hastert. The NIU/NTF partnership hopes to implement some of its long-range plans, including investigating methods for reducing various side effects of radiation. With micro-current therapy, for example, physicians can potentially use low levels of electricity to reduce side effects on skin, such as reddening, pain and reduced movement. Besides physicists, other professionals such as biochemists and biologists are helping to reduce side effects by other intervention methods. For example, when treated for salivary gland tumors located near the ear, many patients suffer varying degrees of hearing loss. Since NIU has very strong nursing, speech and hearing sciences and physical therapy schools, they will be looking into types of intervention to prevent or minimize hearing loss. A team of physicists including Lennox and Yeh envisions a new cancer therapy facility large enough to treat up to 3000 patients per year (the NTF's current limit is 120) in the next four to five years. The new facility would have next-generation accelerators, equipment, and techniques for neutron therapy and proton therapy, and further advance the field of hadron therapy. The proposed facility would also compare photons, protons, and neutrons, and these evaluations would lead to the development of a standardized treatment plan for many types of cancer. Lennox also hopes that neutron therapy can some day be turned into a "product," marketed to hospitals and used throughout the world. Such a step would require licensing the technology, obtaining a patent and producing written operations. Fermilab built a medical proton accelerator for Loma Linda Hospital in California in 1990; since then, Loma Linda has treated 10,000 patients with proton therapy. Lennox hopes neutron therapy can achieve a similar form of outreach. But for now, Fermilab is a rare Mecca for cancer patients. "Some people who come here don't think of Fermilab as a high-energy research lab," says Ramberg. "They think of it as the place that saved their life."